2008 December 31 Dramatic Growth of Open Access - Happy New Year, Open Access! Since Dec. 11, 2008 - a time when many of us have been working less, dreaming of sugar plums, and so forth - the Dramatic Growth of Open Access continues! There are two more institutional mandates, more journals in DOAJ, all the major international open access harvesting services have added more repositories and more items, there are more journals participating in PMC, more providing immediate free access in PMC, and more providing full open access to all articles! For some great recent news on dramatic growth of repositories in developing countries - up 51% in 3 months - from Barbara Kirsop, see Peter Suber on Open Access News. This post is part of the Dramatic Growth of Open Access Series. For my latest major analysis and predictions for 2009, see the December 11, 2008 issue. Happy New Year, Open Access! professional associations, university presses) at minimal cost. libraries should support these affordable options. providing basically the same quality at much higher costs. for an LIS title, and above-average in frequency and quality. obviously, a great deal less than with some other journals. than College and Research Libraries. term, and not just how to cope with the latest budget crisis. services. Open access, of course. Nordisk Barnehageforskning is a brand new mulitlingual (often english) open access journal. In the introductory Editorial, Ingrid Pramling Samuelsson and Jan-Erik Johansson talk about how the field of Early Childhood and Care sector has expanded in recent years, so that now almost all young children are in some kind of care before school age. In contrast, research in this sector is just beginning, with most research in the form of thesis or works published by staff in this area. This new OA journal aims to consolidate research in this field. The editors talk about why it is important to have a local journal for Nordic countries, which share much in common with each other. Articles are published as soon as they are ready. The journal aims to be evaluated as a Level 1 academic journal in Norway. Other countries (such as Canada) have local means of evaluating academic journals, a potentially interesting alternative to evaluation by impact factor. Learning and writing about such journal evaluation alternatives would be an interesting research question. Thanks to Jan Szczepanski for including this journal in his latest collection. Highlights: a quick snapshot of the continuum of access to scholarly journals suggests not only strong growth of open access journals, but a scholarly communications system well on its way to transitioning from toll to open access, with the pure toll access journal (no author self-archiving allowed, no back issues, etc.) a small, and diminishing, portion of the total. The growth of open access journals continues to be dramatic; there are now over 3,700 journals in DOAJ, 781 more journals than last year, 2 new titles per day. While content recruitment at the local repository may seem painfully slow, on a global basis the content and growth are phenomenal, with more than 24 million publications available through Scientific Commons, 19 million through OAIster. Every week, close to 150,000 new items become available through Scientific Commons. 2009 is predicted to be a year of implementation, of Walking the Talking*. The open access movement has crossed many milestones and gone through many learning curves. We now know what makes for good open access policy; OA has been demonstrated to be not only economically viable, but for some, also profitable; and many have become knowledgeable about the tools of OA. It is important not to underestimate, either the work that still needs to be done - or the growing momentum of Open Access. The picture above is a snapshot designed as a rough illustration of scholarly journals in transition as of December 2008. Over 15% of scholarly journals are open access (gold). Another 70% support open access by allowing author self-archiving (green). 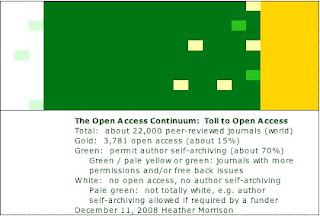 The light yellow and green squares are designed to show that many of these green journals provide additional support for open access, such as free back issues, hybrid open access, or stronger support for OA than other green journals, such as accepting author addenda or permitting posting of the publishers' own PDF. The white journals (from RoMEO white) are the journals that are toll access and do not allow author self-archiving. Even here, there are many journals that allow for author self-archiving under certain circumstances, such as when a funding agencies requires OA. The purpose of this exercise is to illustrate that, while the continued growth of fully open access journals - over 2 titles per day - is indeed dramatic, it is only a small part of the story. In the author's opinion, it is not just the OA journals but indeed the whole of scholarly journal publishing that is in the midst of a transition from toll to open access. There have been some minor decreases in numbers. Highwire Free lost one completely free site; the CARL Metadata Harvester is harvesting one less repository. The PMC Free figures for full-text for recent entries is down slightly. DOAJ new titles is low this month, at 47; this is more likely to reflect staffing flucutations at DOAJ than anything else. Not all of these crossover points are irrevocably crossed over in every circumstance, of course; it is rather that, in the author's opinion, critical mass has been achieved in every area. There are still anti-OA lobbying efforts, and many OA policies still to be developed. It is important not to underestimate the effort needed to complete the tasks of transitioning to OA; but it is also important not to underestimate the considerable momentum of the open access movement. In 2008, Open Journal Systems was taught at many workshops around the world, and at least 3 library school classes developed journals as a class assignment. The NIH experience has taught us what is needed for effective open access policy, and Harvard has provided a new approach to policy. Libraries are going through a learning curve with new, standard services, including repositories and journal hosting. In 2009, new open access policies will have substantial experience both with policy and implementation to draw on. There are many more people now trained and ready to take on the work of creating and supporting open access journals and open access archives. There will be some debate, and no doubt the occasional setback, but overall, the momentum towards open access will continue to grow. Success will bring more success; when people begin to see what an open access archive can do, recruiting content will become much easier. Journals that see other journals successfully transition to OA will find it easier to convert themselves. As university administrators and faculty ponder the open access policies of funding agencies, and the benefits of open access to them, the will to implement will grow, and along with it, needed support. As for the worldwide recession, this may cause some slowing of the growth of everything, including open access. However, the recession also provides incentive for seeking more cost-effective ways of doing things, and so a strong incentive to move to open access, a topic covered in more depth in my Essential Efficiencies series. In numeric terms, a conservative estimate would be about 20% of the world's scholarly journals fully open access by the end of the year, and watch for noticeable increases in growth rates in repositories at the local level. * Walking the Talking is the name of the Canadian Library Association Open Access Interest Group's preconference to the Second International PKP Scholarly Publishing Conference. Thanks to Leah Vanderjagt of the University of Alberta / CLA OAIG for setting such a timely theme and title. Open Government Records is a new plug-in, still in beta, for Open Journal Systems, created by Simon Fraser University's Mark Weller. According to the website, OGR "publishes freedom of information (FOI) and Access to Information (ATI) journals. These FOI or ATI journals contain the text of freedom of information requests and the responsive records that the public bodies disclosed'. "Journals" to date are FOI Journal of Public Servant Curriculum, FOI Journal of Amber Light Requests, and ATI Journal of Ministries of Education. Joan Cherry's class at the Faculty of Information Studies, University of Toronto, has created an open access journal, Scroll: Essays on the Design of Electronic Text. This looks great - congratulations, Joan and class! Earlier this summer, I did a presentation for Joan Cherry's class based on the OA journal by my scholarly communications class, which I blogged about here. Joan Cherry's class and mine are quite different, almost complementary, as mine focuses on the scholarly aspects of scholarly publishing, while Joan's focuses on the technical aspects of publishing. Maybe someday we should co-teach, even from a distance. The not-for-profit Bioline International describes itself as "a pioneer in the provision of open access to peer reviewed bioscience journals published in developing countries". Bioline International assists publishers in developing countries with establishing a high-quality online presence; Bioline currently aggregates close to 60 journals, from about 15 countries around the world. Bioline International is currently moving to a library membership model. Libraries are asked to contribute $500 per year to support this initiative. This is not much to ask; less than the cost of an average single journal subscription in most academic fields. This is a much easier way for libraries to ensure access to these journals than was possible in the days of print, where locating such journals, negotiating local currencies, and arranging for mailing made support quite challenging. By providing an online presence and the optimal dissemination that comes with open access, Bioline International is reducing the south to north knowledge gap, and facilitating the participation of scholars in the developing world in advancing our global knowledge. One area where the developing world may bring welcome perspective in the short term as we deal with the current economic crisis, is an increased likelihood that scholars in the developing world working on applied fields, will be looking for more cost-effective solutions. This is because Necessity is the mother of invention; when you don't have much to spend, it's easier to focus on potential solutions that don't cost very much. Bioline International also reduces the south-to-south knowledge gap, sharing of knowledge from one developing country to another, and also providing a local venue for publishing. Such local venues are a better bet for publishing research on topics of greater interest in the developing world (such as malaria and river blindness). Creating publishing opportunities can only increase the odds that researchers will choose to focus on these topics. It is good to see that Canadian libraries are well represented among the early sponsors and members of Bioline International! Both Google and Amazon are offering free data storage for scientists. Thanks to Mark Jordan. The costs of scholarly journals directly related to print, that is, the costs of printing and distributing by mail, have been estimated at about 20-30% of a journal's cost. Fortunately in these difficult economic times, this means that the vast majority of scholarly journals have a ready means to decrease costs by 20-30%. If these savings are passed along to customers, this will do wonders for the sustainability of our scholarly publishing system in the critical near to medium term. Christopher V. Hollister, in Economics of Open Access talks about the recent move by the open access journal Communications in Information Literacy to provide Print-On-Demand (POD) via lulu.com, providing libraries and readers wishing a quality print journal with the service they desire, in a manner that EARNS modest revenue for this journal, rather than COSTING revenue. (Hat tip to Brian Owen for a pointer to Hollister's article). As Hollister points out, POD is not only a good move economically, it is also environmentally friendly; no unwanted print issues are produced, and printing can happen locally, reducing shipping costs. Many libraries have been moving to electronic-only subscriptions for years now. In difficult economic times, even more libraries will be looking for such efficiencies. A move to electronic-only / POD to support open access, or to reduce subscription costs, would likely be very much welcomed by library customers in these difficult times. This post is part of the Essential Efficiencies and Transitioning to Open Access series. That is to say, in addition to publishing, scholars are expected to contribute service as well. If membership in a scholarly society is considered important to tenure and promotion committees, then scholarly societies are likely to have very healthy memberships, without having to rely on withholding scholarly information from non-members (i.e., subscriptions). How can scholarly societies get on the priority list for the tenure and promotion committees? Through their members! The current economic crisis could be an opportune time to talk to university administrators about this cost-free way to support society publishers, many of whom have a well-deserved reputation for high quality at low costs - not to mention all the other good works done by scholarly societies. This post is part of the Transitioning to Open Access and Essential Efficiency Series. Essential Efficiencies is a series of ideas designed to help scholars, scholarly publishers, and librarians to move forward towards open access and a sustainable scholarly publishing system despite difficult economic times. This series, began in December 2008, is closedly related to the Transitioning to Open Access Series. Growing Canadian membership in DOAJ!. The number of fully open access, peer-reviewed journals is substantial, and growing. This is great news for the collections budget, but creates a need for efficiencies in tracking the journals. A DOAJ membership is a GREAT bargain in comparison to either doing the work of tracking at your library, or searching and re-searching journals if these journals are not tracked and added to the library's collection. Elsevier plus LexisNexis earned more than $1.5 billion in profit in 2008. The increasing profits at STM publishers at a time of global economic crisis is a great illustration of an inelastic market. Wiley Revenues up 36% in 2008. Will such strong financial health for a large scholarly publisher - revenues up to $1.7 billion in 2008 from $1 billion in 2007, coupled with an overarching goal of good long-term relationships with customers, mean relief for library customers hard-hit by the financial crisis? A re-analysis of data provided by the American Society for Cell Biology illustrates that if Molecular Biology of the Cell were to drop its print edition, article processing fees (page and colour charges) are already covering all but 7% of the costs - and possibly all of the costs. Dropping print and going online / open access not only brings access benefits for authors, but also the opportunity to add more colour without incurring most cost. Originally posted to Liblicense. Points out the need for libraries to adopt an holistic approach to scholarly communication, and support affordable alternatives, such as scholarly society publishing - and open access. Bioline International: Supporting Quality Open Access Publishing in the Developing World. The not-for-profit Bioline International helps publishers in the developing world to develop a high-quality online, open access presence. Libraries are encouraged to join the Bioline International membership program; at $500 per library, this is less than the cost of a single journal subscription in most academic fields, and a whole lot easier than providing this kind of support ever was in print! A journal that is produced in both print and electronic form can save about 20% - 30% of costs by dropping print, and moving to print-on-demand (POD). One innovative open access journal is using POD as a means to EARN revenue. When authors seek reviews from colleagues even before submitting a paper for publication, the result is likely a higher quality paper, in less need of work in the reviewing, editing and copyediting stages. Journals that save money in this fashion are well advised to pass savings along to customers, to minimize potential cancellations. In these difficult economic times, it would be wise for scholarly journals to seek means of reducing costs, for several reasons. First, the budgets of many library customers will be adversely affected by the economic situation. Happily, there are ways to reduce costs, so that scholarly publishers could reduce prices and minimize potential cancellations with little or no impact on revenue. This post is the first in a series on efficiencies in scholarly publishing, examining the potential of pre-submission peer review as a means of reducing the work involved in copyediting and coordination of peer review. Please note that this is a suggested addition to traditional blind post-submission peer review, not a replacement. The idea is to encourage authors to arrange for colleagues to review their papers even before they submit their papers for publication. While this will not eliminate the need for subsequent peer review, it should improve the quality of work received by a journal, reducing the subsequent workload for copyeditors and peer reviewers. Anecdotally, I have seen some evidence suggesting that this works; as a reviewer and editor I have seen works that the author had reviewed before submission which needed almost no work. I have asked colleagues to review my work before submission, and have reviewed works for others before submission, so that I have seen firsthand the improvement in quality with pre-submission peer review. An author who submitted a preprint to arXiv, told me that they found that taking into account the comments on the preprint resulted in a submission that needed little work in the review stage. This would be a good topic to research. A journal might benefit from pre-submission peer review from procedures as simple as posting information on the journal website encouraging the practice, or perhaps asking a question on the submission form. A stronger form of encouragement would be to prioritize pre-reviewed works for processing, or to write to authors whose articles are obviously in need of such assistance, suggesting that they consider pre-submission peer review on a voluntary basis. While open access is a completely separate topic from publishing reform, these kinds of efficiencies will help a smooth transition to open access. This post is the first in a series on Essential Efficiencies.